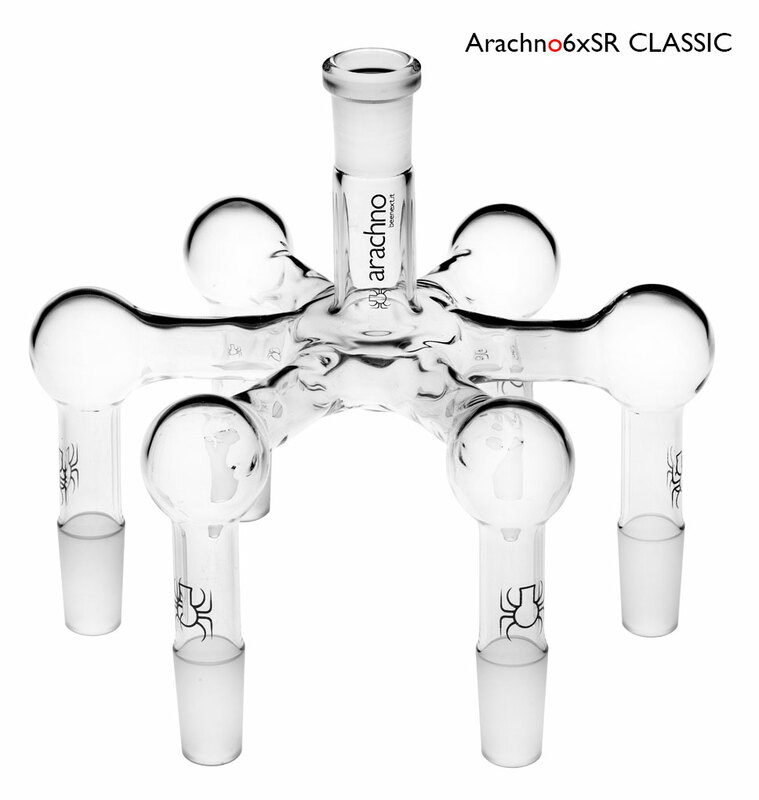 Arachno CLASSIC Being the simpler example of expression of the arachno technology, the Classic low cost model represents the entry level inside the Arachno family. It is available with two different legs length (4 and 13 cm), always in six legs version. In order to avoid any disconnections, a special six Swiss-made stainless clips are also included. The model 6XLR, owing longer legs able to act as air condenser, can support also the mixture heating (b.p. >100). Six 4 cm-legs supported with male 14/24 joints. Arachno SCREW The Screw class represents the most advanced arachno family members. 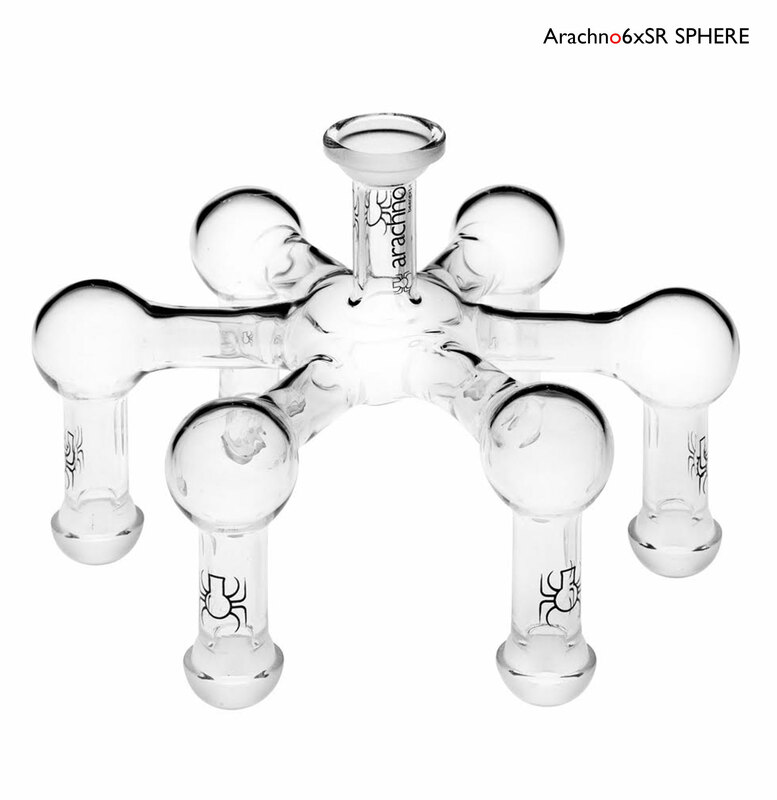 Being a top level product, arachnoScrew guarantee high performances as well as toughness. 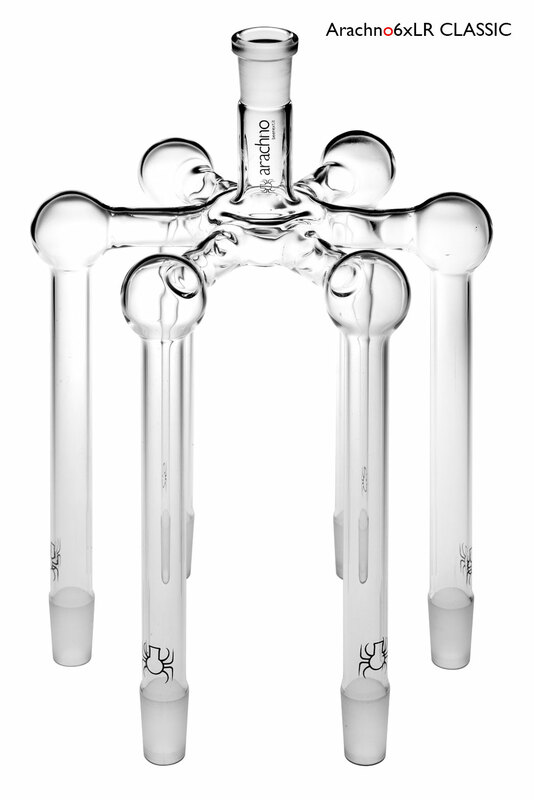 Each leg is supported with a male Rodaviss14/24 joint, able to support also heavy flasks as well as specific accessories as a water condenser. It is also proposed in triangular-C3 symmetry with three legs specifically designed for involve bulky experiments, in this case, bigger teflon stirring bars (25 mm) are suggested. 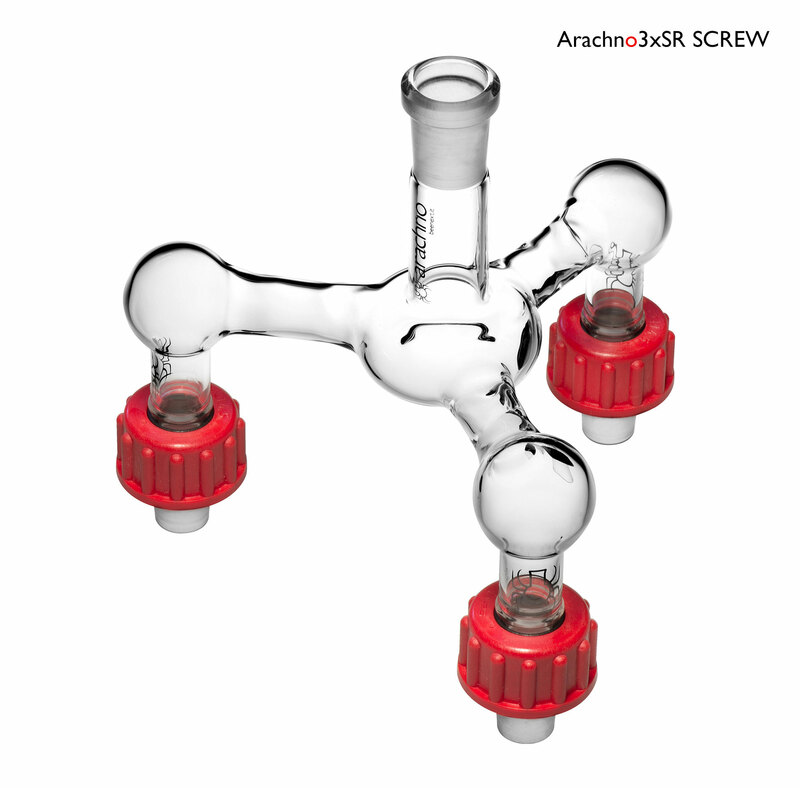 The arachnoScrew 6XST is able to include all the hood requirement inside a single apparatus. 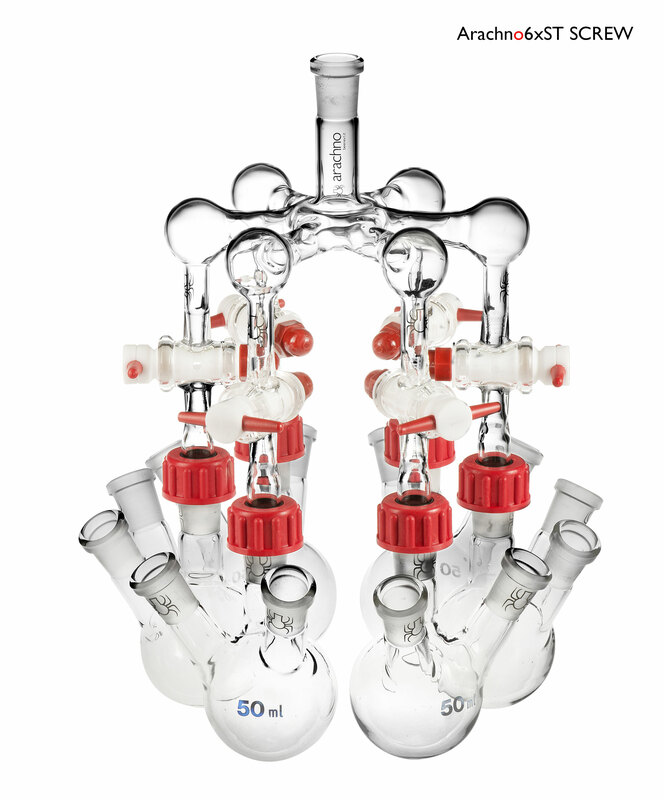 Here the manifold concept , daily used by every chemist, is completely re-invented including it inside an arachnostructure. As in a manifold itself, each leg, can be isolated by the presence of a Teflon Stopcock switch from the apparatus body. In this manner you can add/remove single flasks while an experiment is running. One central female GSF19/9 joint. Six 4 cm-legs supported with Stopcok Teflon switch and male 14/24 joints. One central female 14/24 joint. – The 6XSR is equipped with a pressure resistant GSF19/9 joint on the central body (female) as well as on all the legs (males). This kind of joints are quite attractive when a pressure is involved. The 6XSR can be applied when pressure related reaction (catalytic hydrogenation) is involved or just as a gas disposal apparatus. 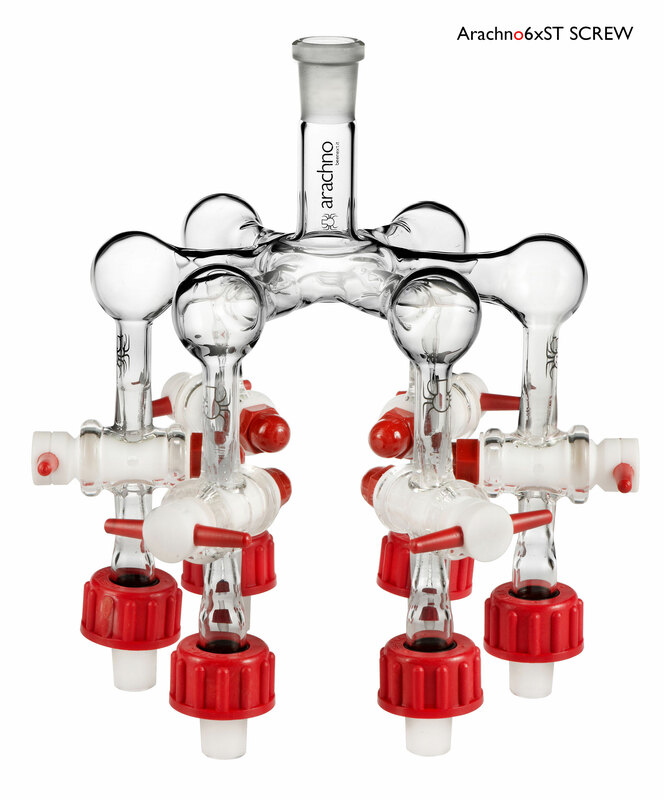 – To the other side, the 6XST can be see as the world’s most compact manifold. 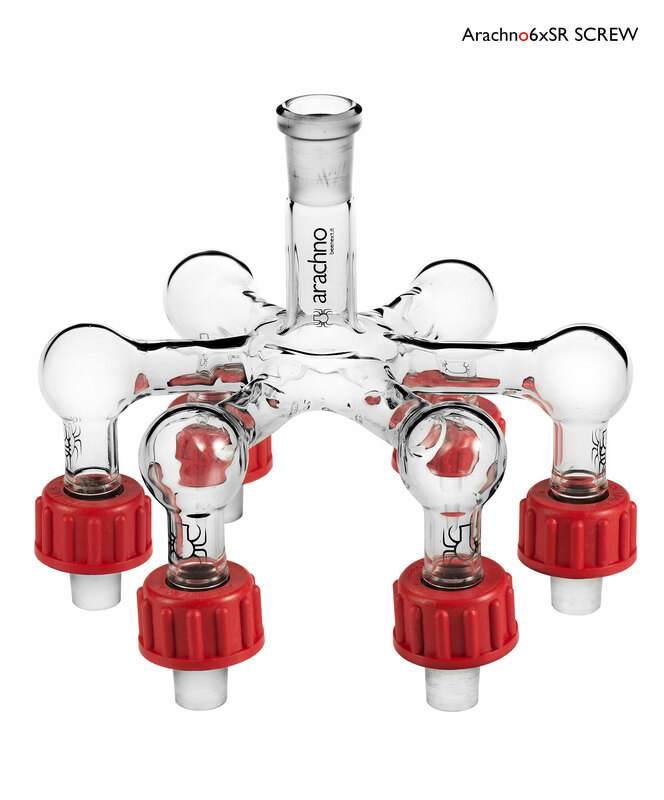 Each leg is present with a Teflon stopcock switches female, equipped with a tubing older. 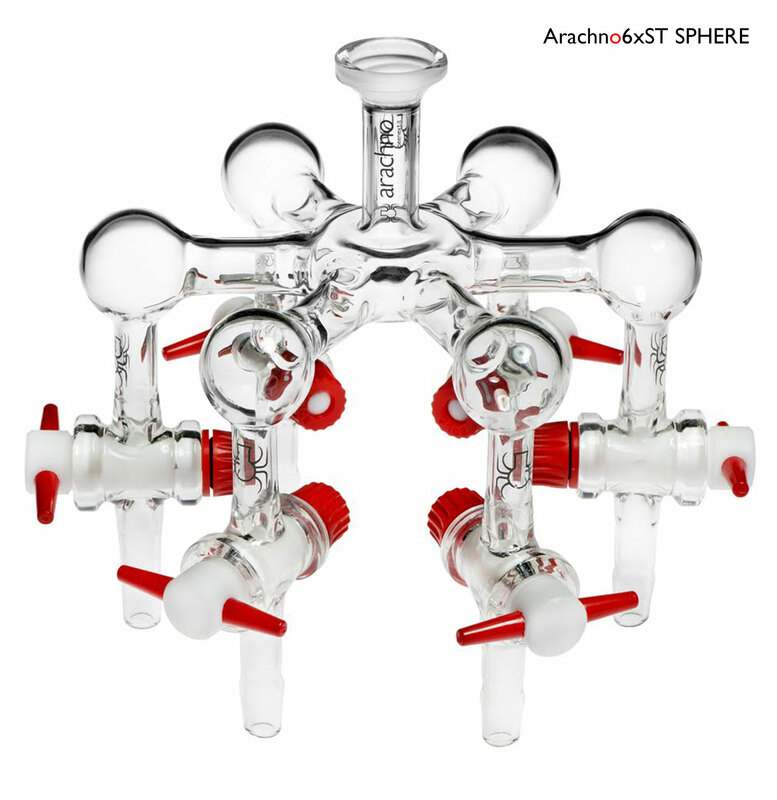 If you have a crowed hood and need a compact manifold, this is your arachno!!! Six 4 cm-legs supported with male round joints. One central female round joint.